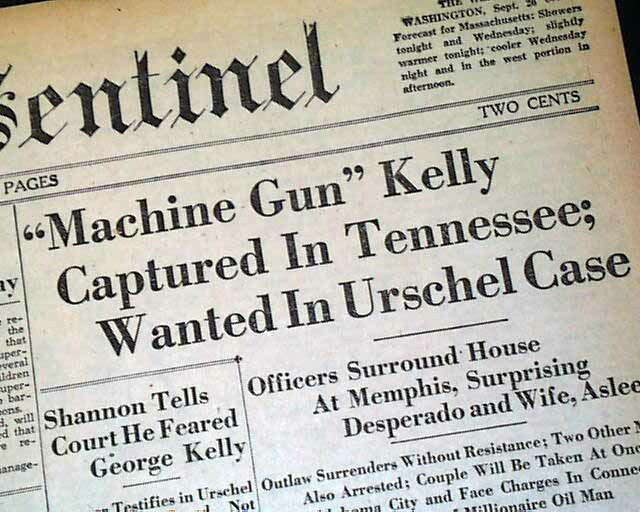 This 10 page newspaper has a three column headline on the front page: ""Machine Gun" Kelly Captured In Tennessee; Wanted In Urschel Case" which tells of the capture of George 'Machine Gun' Kelly (1st report). Other news of the day throughout including period advertising. This issue has minor margin wear, but it is otherwise in good condition. wikipedia notes: As he lived in the Prohibition era of the 1920s and 30s, George was able to find both work with a bootlegger as well as a colleague. After a short time, he had several run-ins with the local Memphis police, he decided to leave town and head west with a new girlfriend. To protect his family and escape law enforcement officers, he changed his name to George R. Kelly. He continued to commit smaller crimes and bootlegging. He was arrested in Tulsa, Oklahoma, for smuggling liquor onto an Indian Reservation in 1928, and sentenced for three years to Leavenworth Penitentiary, Kansas. Sent to Leavenworth on February 11, 1928, he was a model inmate and was released early. 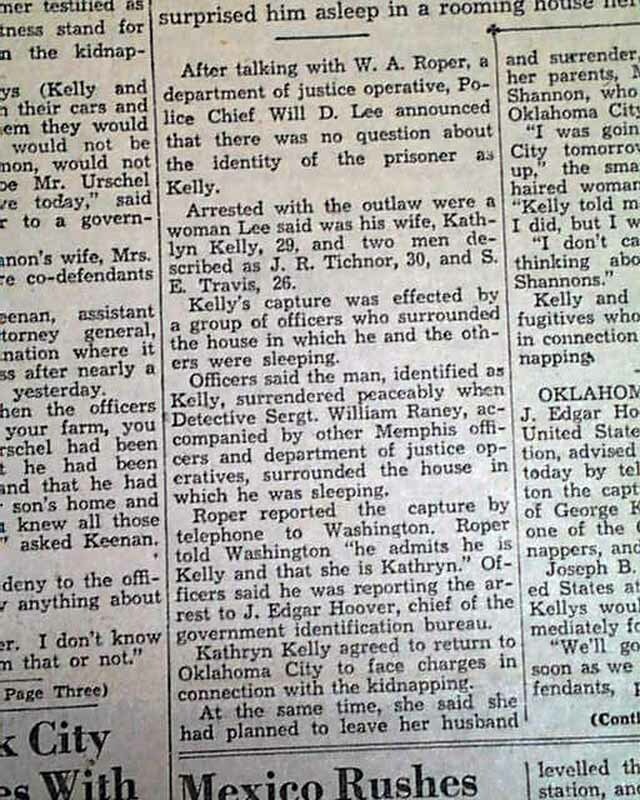 Shortly thereafter Kelly married Kathryn Thorne, who purchased Kelly’s first machine gun and went to great lengths to familiarize his name in the underground crime circles. Some historians claim that Kathryn coined the nickname "Machine Gun Kelly" and even went so far as to plot some small bank robberies. 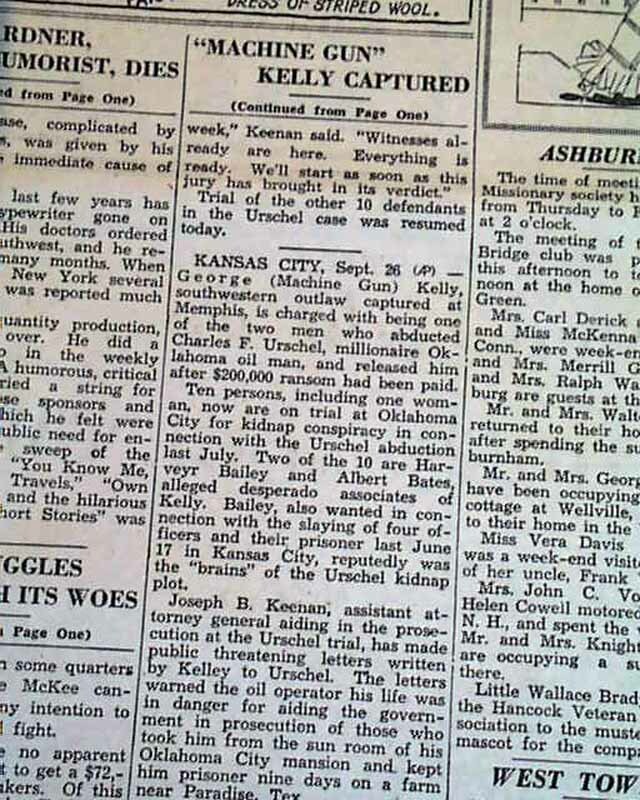 Nonetheless Kelly’s last criminal activity proved disastrous when he kidnapped a wealthy Oklahoma City resident, Charles F. Urschel and his friend Walter R. Jarrett. Urschel, having been blindfolded, made sure to foil his kidnappers by noting all possible evidence of his experience such as carefully noting background sounds, counting footsteps and leaving fingerprints on every surface in reach. This in turn proved invaluable for the FBI in their investigation, as they learned that Urschel had been held in Paradise, Texas. An investigation conducted at Memphis disclosed that, after 56 days on the lam, the Kellys were staying at the residence of J.C. Tichenor. Special Agents from Birmingham, Alabama, were immediately dispatched to Memphis, where, in the early morning hours of September 26, 1933, a raid was conducted. George and Kathryn Kelly were taken into custody by FBI Agents and Memphis police. Caught without a weapon, George Kelly supposedly cried, "Don’t shoot, G-Men! Don’t shoot, G-Men!" as he surrendered to FBI Agents. The term, which had applied to all federal investigators, meaning simply 'Government Men' became synonymous with FBI Agents. Reports of the raid, however, indicate that George Kelly came to the door, dropped his pistol and said, "I’ve been waiting for you all night." 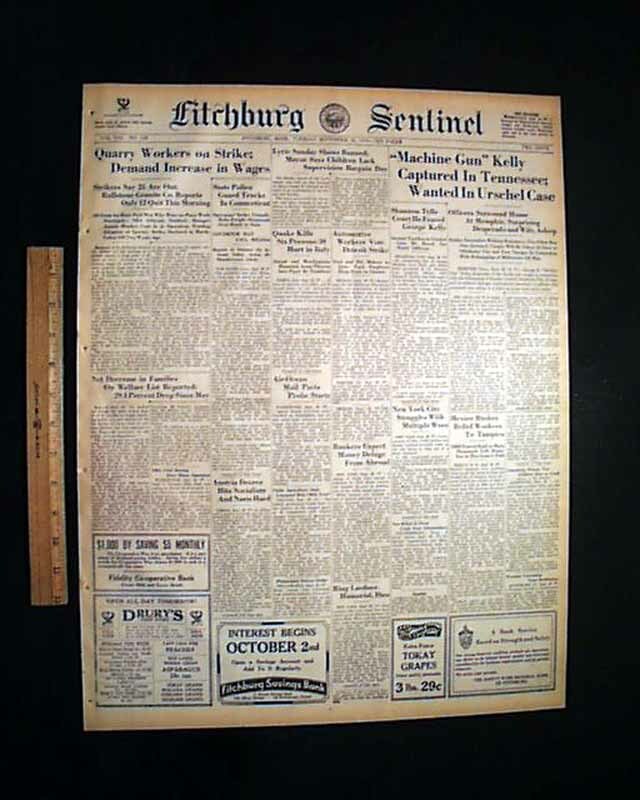 Recent research revealed a 1933 newspaper interview with one of the federal agents at the arrest. He commented that, upon their arrest, Kathryn Kelly put her arms around George and said, These G-men will never leave us alone. Thus, it was actually Kathryn Kelly who coined the term. However, the FBI press machine generated the G-Man story to build its own reputation. On October 12, 1933, George and Kathryn Kelly were convicted and sentenced to life imprisonment. 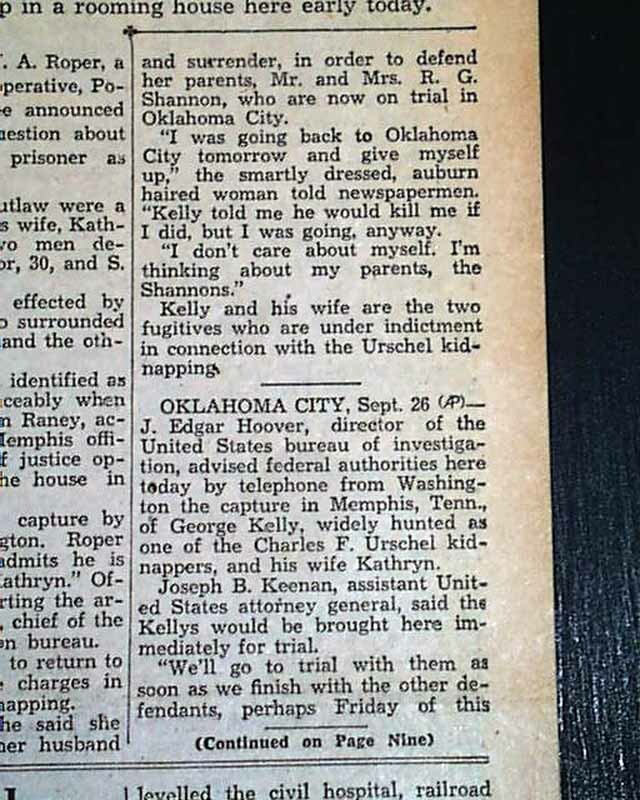 Kathryn Kelly and her mother had all charges dropped and were released in 1958. 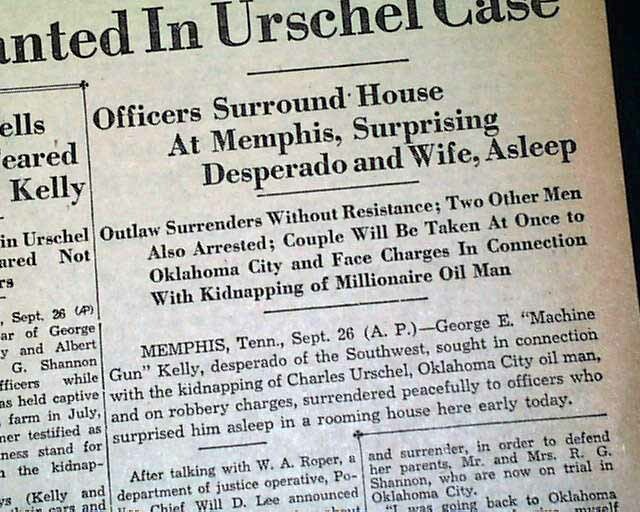 The kidnapping of Urschel and the two trials that resulted were historic in several ways: 1) they were the first, last, and only federal criminal trials in the United States in which moving cameras were allowed to film; 2) the first kidnapping trials after the passage of the so-called Lindbergh Law, which made kidnapping a federal crime; 3) the first major case solved by J. Edgar Hoover’s evolving and powerful FBI; and 4) the first crime in which defendants were transported by airplane. At the time it was the largest ransom ever paid in the United States. Most historians agree that it also marked the end of the Gangster Era in America.